range of physiological application at I = 0.16 mol·kg–1. (0.008695 mol·kg–1) and Na2HPO4 (0.03043 mol·kg–1). ence standard for routine laboratory measurements. (MOPS) from 5˚C to 55˚C. mol·k g–1) + NaACES (0.08 mol·kg–1). L. N. ROY ET AL. without the chloride ion and seven solutions with Cl–. liquid, and gaseous states, respectively. Ej = Ej(s) – Ej(x). where “k” is the Nernst slope. entered in Tables 2 and 3 from 5˚C to 55˚C. outlines the method used for obtaining this figure . lated from Equations (5) and (6) are designated as pH(s). 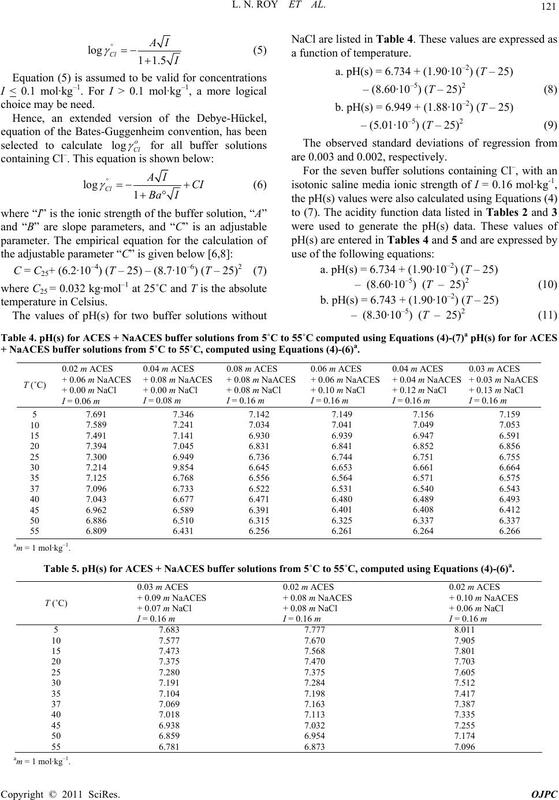 p(aHγCl) of ACES + NaACES buffer solutions from 5˚C to 55˚C, computed using Equations (4)-(6)a. 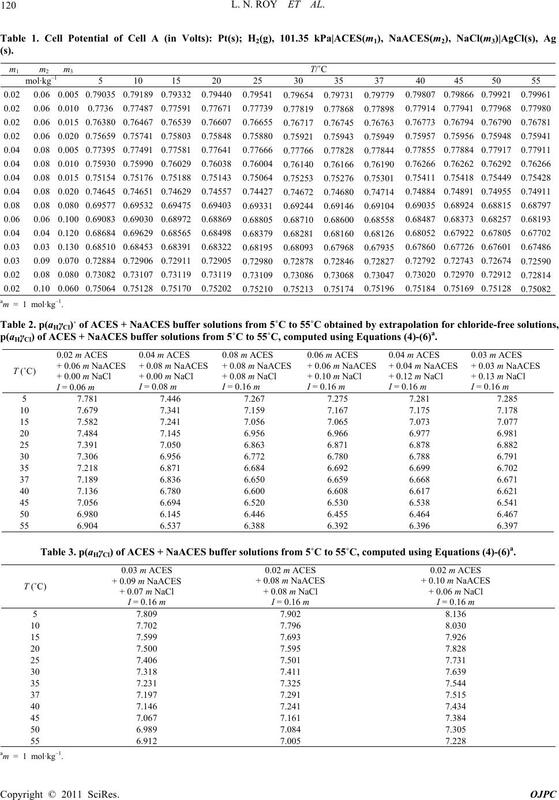 Table 3. p(aHγCl) of ACES + NaACES buffer solutions from 5˚C to 55˚C, computed using Equations (4)-(6)a.
are 0.003 and 0.002, respectively. + NaACES buffer solutions from 5˚C to 55˚C, computed using Equations (4)-(6)a. Table 5. pH(s) for ACES + NaACES buffer solutions from 5˚C to 55˚C, computed using Equations (4)-(6)a. Table 6. Emf of Cell B and pH values with δEj correction at 25˚C and 37˚C for ACES buffer. tion theory of Pitzer [17,18] for the calculation of logγCl. engths for practical pH measurements. Institutes of General Medical Sciences. N. E. Good, G. D. Winget, W. Winter, T. N. Connolly, S.
try, Vol. 104, 1980, pp. 300-310.
neering Data, Vol. 42, No. 1, 1997, pp. 41-44.
reau of Standards, Vol. 65A, 1961, pp. 267-270. Chemistry, Vol. 18, 1972, pp. 206-208. Chemistry, Vol. 61, No. 13, 1989, pp. 1400-1405.
tions,” Analytical Chemistry, Vol. 65, No. 8, 1993, pp. R. N. Roy, D. R. Mrad, P. A. Lord, J. 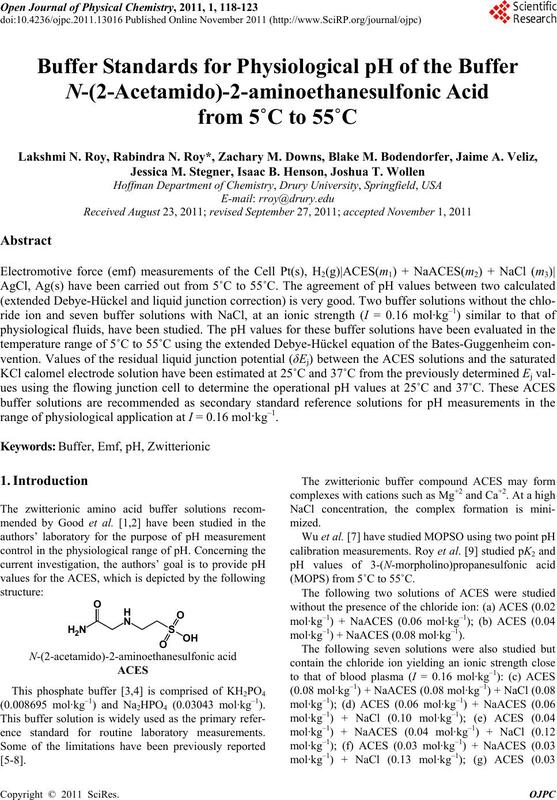 A. Carlsten, W. S.
Journal of Solution Chemistry, Vol. 27, No. 1, 1998, pp. & Sons, New York, 1973. R. N. Roy, L. N. Roy, C. E. Denton, S. R. LeNoue, S.
Ashkenazi, M. S. Fuge, C. D. Dunseth, J. L. Durden, C.
cal & Engineering Data, Vol. 54, 2009, pp. 428-435. 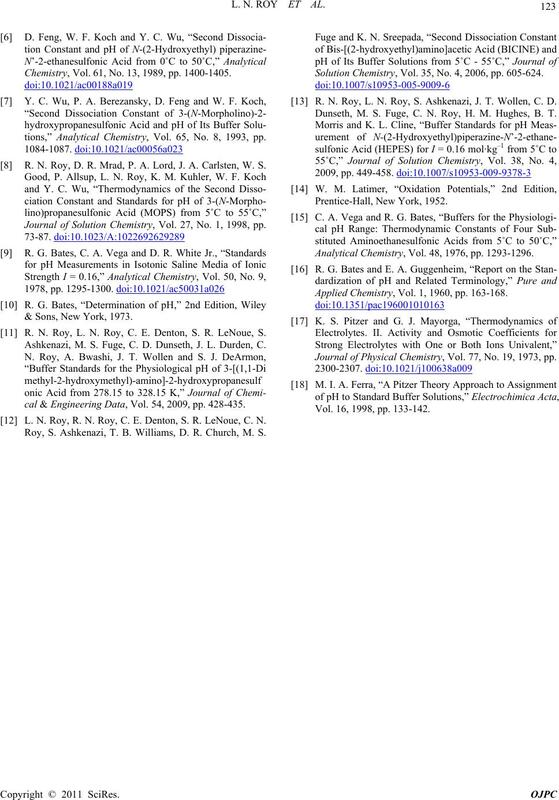 L. N. Roy, R. N. Roy, C. E. Denton, S. R. LeNoue, C. N.
Roy, S. Ashkenazi, T. B. Williams, D. R. Church, M. S.
Solution Chemistry, Vol. 35, No. 4, 2006, pp. 605-624. R. N. Roy, L. N. Roy, S. Ashkenazi, J. T. Wollen, C. D.
Dunseth, M. S. Fuge, C. N. Roy, H. M. Hughes, B. T.
Analytical Chemistry, Vol. 48, 1976, pp. 1293-1296. 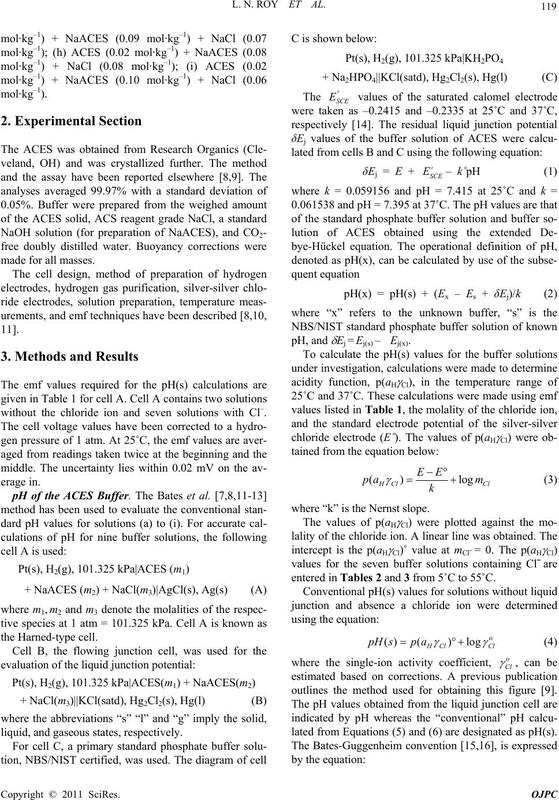 Applied Chemistry, Vol. 1, 1960, pp. 163-168. 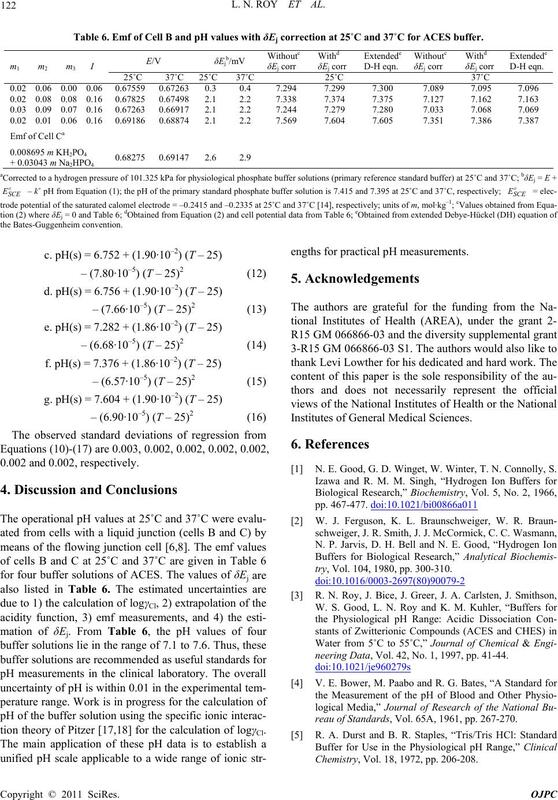 Journal of Physical Chemistry, Vol. 77, No. 19, 1973, pp. Vol. 16, 1998, pp. 133-142.